In the heart of New Delhi lives what is said to be the world's largest collective of performers -- puppeteers, drummers, monkey tamers, snake charmers, singers, acrobats, and more. Their family units can include more than a dozen members. Dads and moms pass their art down to the kids. In Kathputli Colony that's simply how things are done. 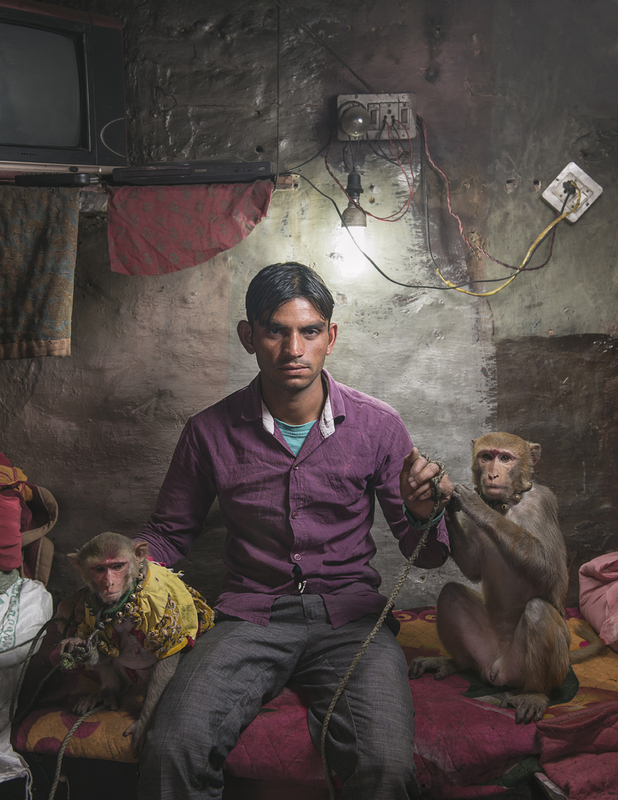 Chatta Khan, a 45-year-old monkey tamer, is just one of thousands of performers living in the famed Kathputli Colony. By Mark Leaver. Whether tradition will continue this way is another story. The 3,000 families of Kathputli are facing a major threat to their way of life, a standoff that's mesmerized local papers and documentarians abroad who have trekked to the so-called magician's ghetto to capture what could be its final days. 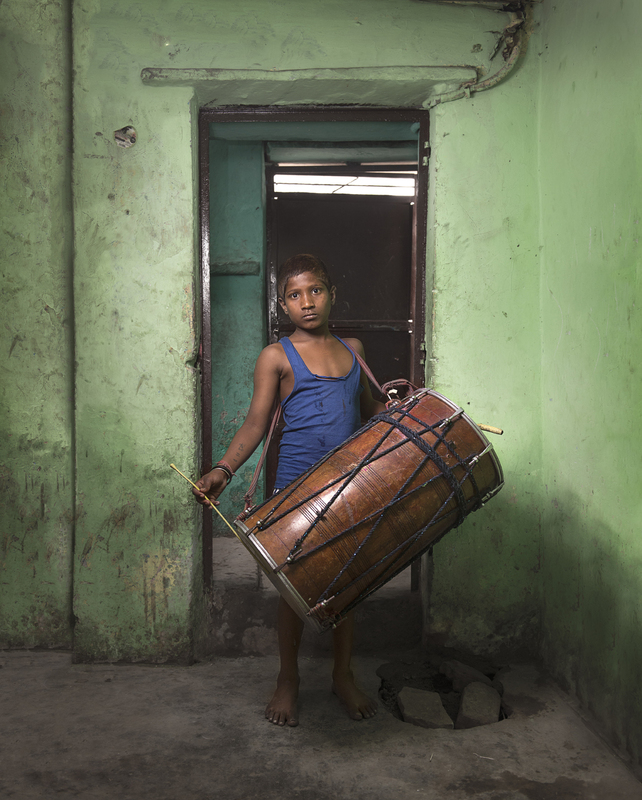 Honey Bhatt, 12, is a drummer. By Mark Leaver. 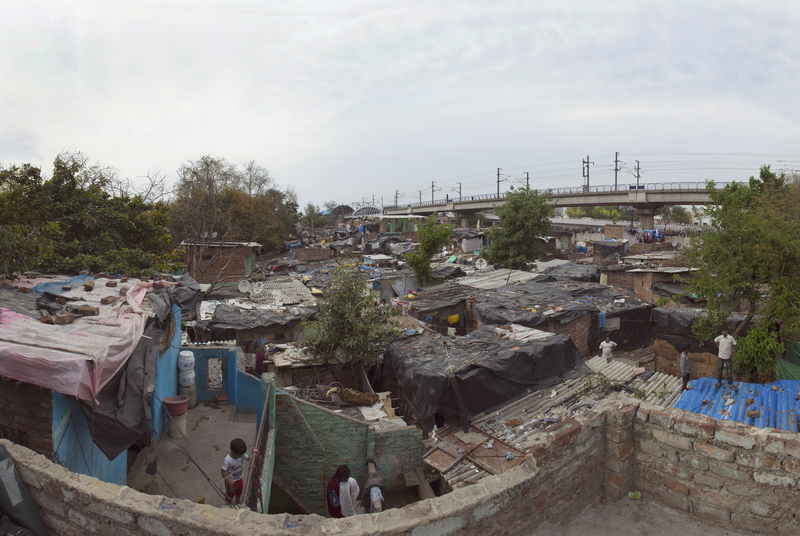 The colony began in the 1950s, when Delhi was not so dense as it is today. Now the land it sits on is central and valuable. Accordingly, powerful entities are vying for it. The civic body who owns the land, the Delhi Development Authority (DDA), plans to evict all the current residents to make room for luxury flats and a shopping mall. 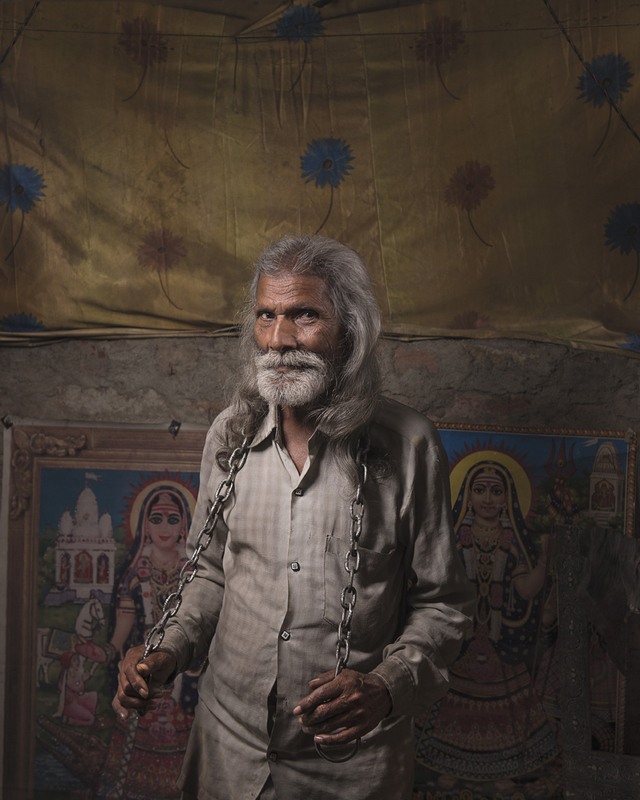 Portrait of Punna Gujat, a 65-year-old chair-maker. By Mark Leaver. 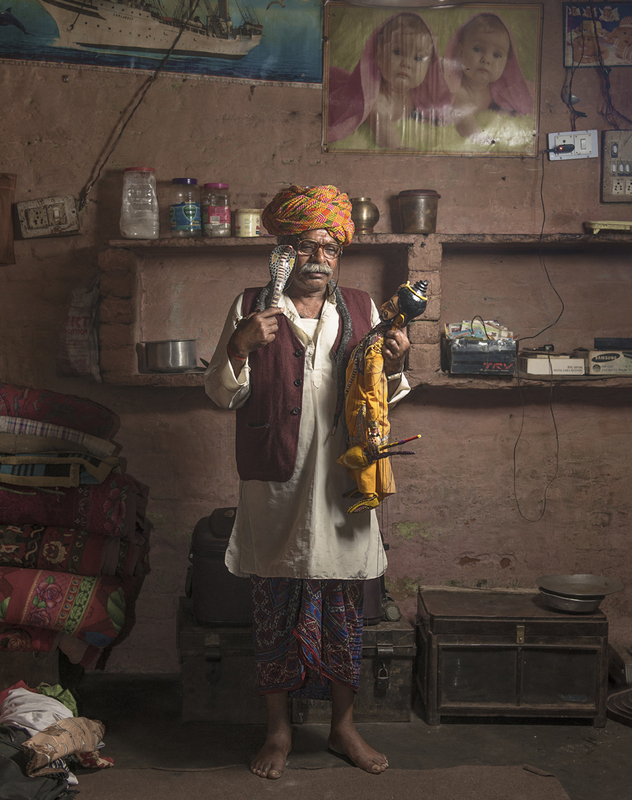 Kathputli means "puppeteers," but the word has come to stand for every type of magic that happens in the 6.5-acre colony. Recently, photographer Mark Leaver visited to record the scene before it disappears. Leaver took portrait style shots of the performers in their homes, which he plans to compile into a book. 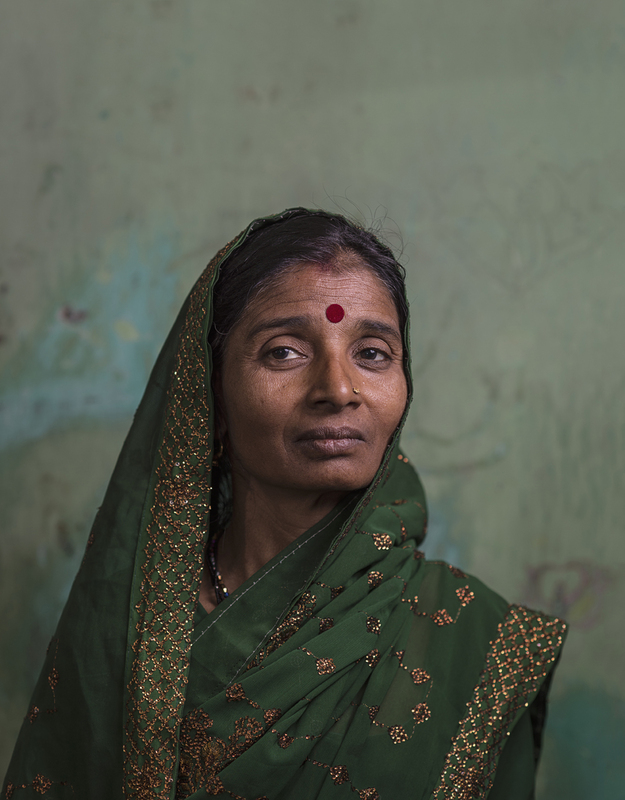 Sundra Beui lives in the colony with her husband, a painter. By Mark Leaver. The accommodations are hardly luxurious. The houses are basic and crowded onto narrow streets that smell of sewage. Families often sleep on the floor to store their equipment. Because of the colony's slum-like spirit, DDA officials and others behind the conversion justify the imminent bulldozing as a lifestyle improvement. 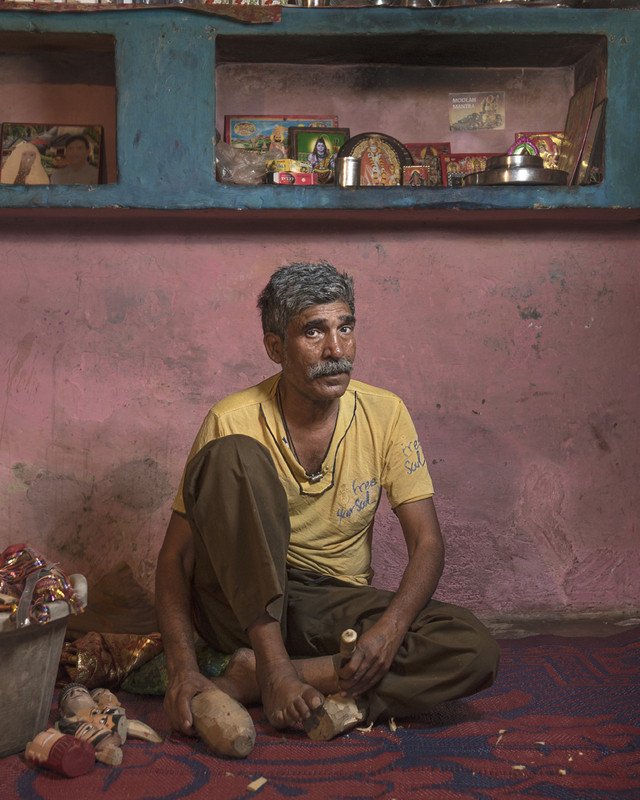 Laxshman Bhatt is one of many puppet makers in the colony. By Mark Leaver. But residents argue that their unique lifestyles are necessitated by their art, and therefore unimpeachable. "Our lifestyle is our identity," Aziz Khan, a magician who holds a Guinness World Record title, told a Time reporter who visited the colony in March. "The lifestyle of a multistory building is not for us." 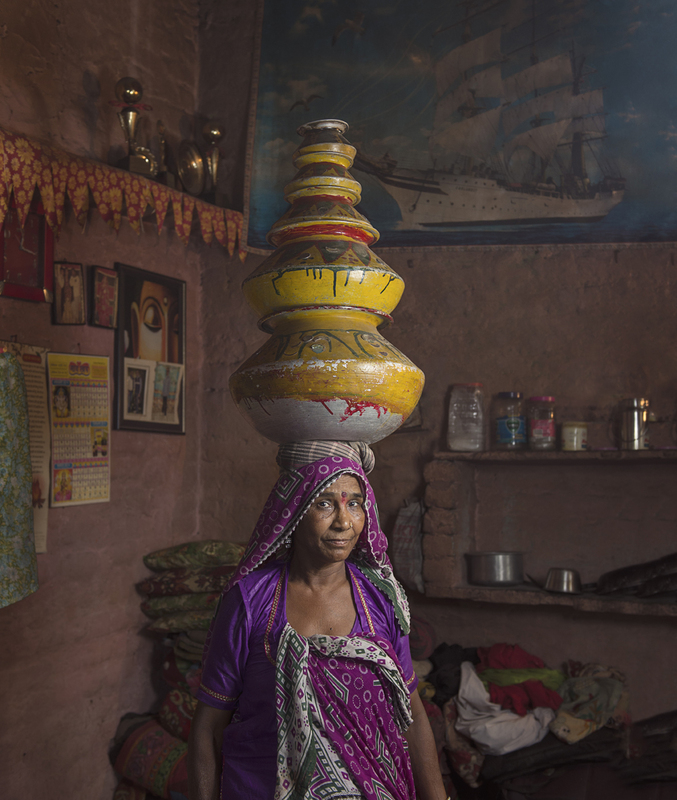 Fifty-year-old Basanti Bhatt has perfected the art of head balancing. By Mark Leaver. The DDA's line is that the project caters to residents, who are slated to shift to a high-rise building billed by the government as a modern artists' community equipped to nurture street art. Residents are largely skeptical. They doubt they can store puppets as large as 15 feet in a "cramped flat," as the colony's eldest resident, puppeteer Puran Bhat, told Time. And their families are larger than average. Bhat's, for instance, comprises 18 members. Puppeteer Jagdish Bhatt poses with one of his dolls. By Mark Leaver. Then there is the interim housing the DDA is encouraging residents to move into right away, which many have criticized as shoddy and susceptible to wind damage. Last month saw incidents of police violence against men, women and children in the colony, including beatings by baton and tear gas sprays. One 15-year-old boy described being dragged out of bed while sleeping, beaten and slapped, and taken to the police station, where "a senior cop asked me why we didn't shift to the transit camp at Anand Parbat." 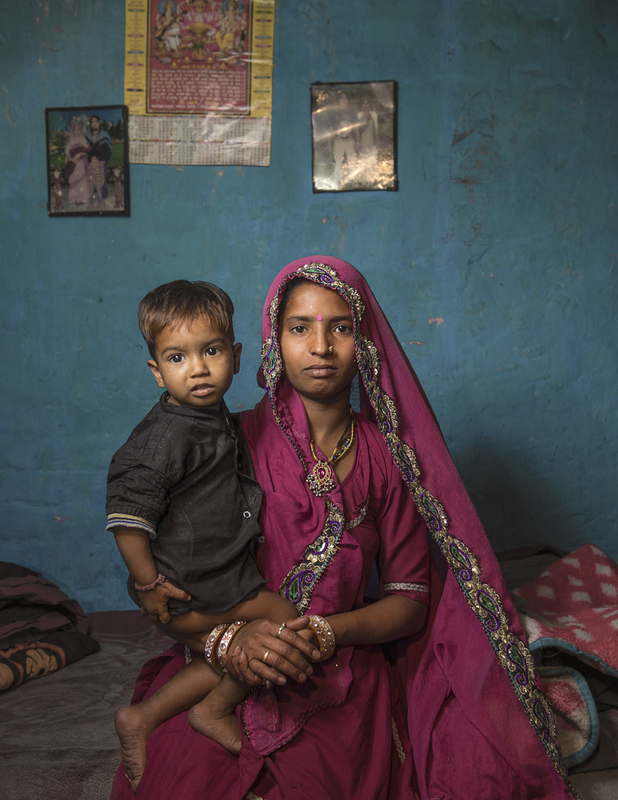 Thirty-year-old Susila Bhatt holds her son Moono, one of the colony's youngest residents. By Mark Leaver. Speaking to Time, one magician blamed the aspirations of "middle-class India" for making a mass eviction possible. Folk artists, he opined, are "at odds with the image of India as a rising power." Many are hoping to sway the government into preserving the colony as a tourist attraction, a workaround that could address the issue of national self-image. 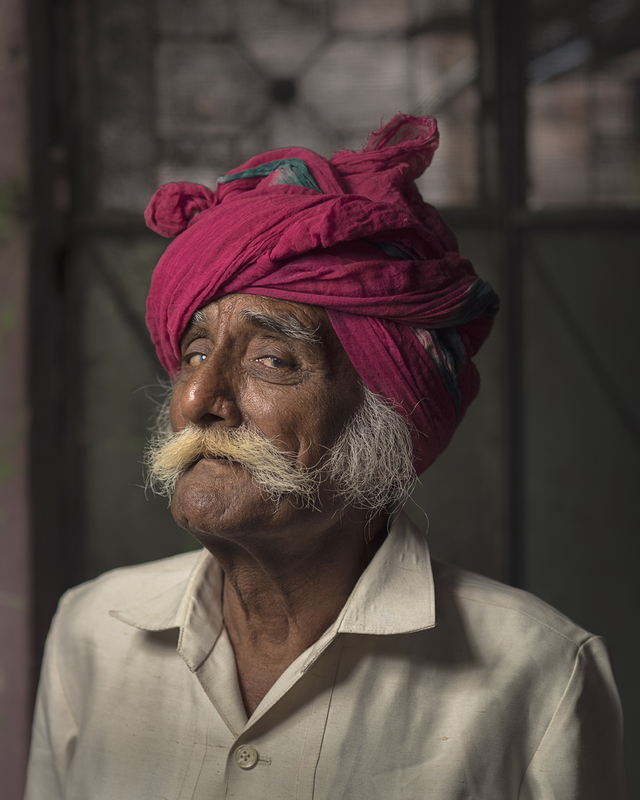 At 80 years old, puppeteer Kesar Bhatt is one of the colony's eldest residents. By Mark Leaver. The tented homes of Kathputli. By Mark Leaver. For a non-static view into Kathputli, check out Tomorrow We Disappear, a 2014 Tribeca Film Festival documentary that hits select theaters next month.